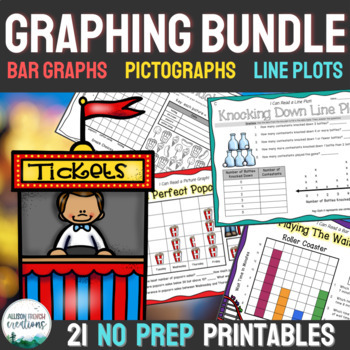 If you're looking for fun, engaging activities to teach your students about bar graphs, pictographs/picture graphs, and line plots...you've made it! This mini unit is anything but "mini". 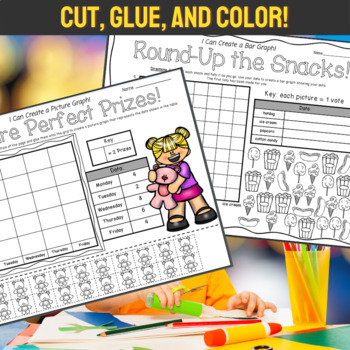 With over 50 pages, (21 pages of print-and-go ready materials plus answer keys for every single page) this can serve as the perfect resource for whole group math time, small group, and centers/workstations! There's plenty to choose from! Pick and choose which ones to use- there are different versions of some worksheets to allow for differentiation as well. - Round-Up the Snacks: use tally marks to cross off each snack picture. After collecting the data, create a bar graph. 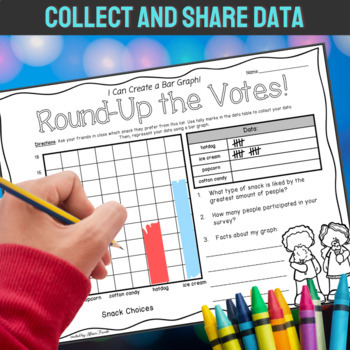 - Round-Up the Votes: students poll their classmates to find out which snack they prefer. After gathering data, they create a bar graph and answer questions. -Knocking Down Line Plots (A): read the line plot and complete the data table. 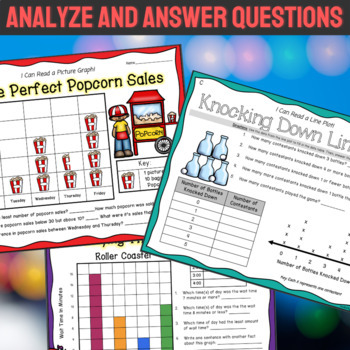 Then answer the comparison questions about the data. -Knocking Down Line Plots (B): read the line plot and complete the data table. Then answer the comparison questions about the data. -Knocking Down Line Plots (C): read the line plot and complete the data table. Then answer the comparison questions about the data. -"X" Marks the Spot: use data from the data table to create a line plot. Then answer questions about the data. - Height Requirements: using information about ride height requirements, complete the line plot and answer the higher order thinking questions.